Over/Under: Over 169.5 at 1.90 Bet Now! Both of these teams currently hold a 2-3 record but this only indicates that statistics rarely tell you the full story. This is because the hosts won their first two home games of the season but come into this clash on a three-game losing streak. Conversely, the Istanbul side lost their opening three games of the season but have won their last two games, which means the mood in the two camps will be very different. The Turkish side holds a 15-5 record over Milan, which will be another aspect that provides the away side with impetus coming into this clash in Italy. Milan were looking good after two games of the season but after failing to win any of their last three games, they desperately need a win here to keep their season on track. Rakim Sanders is the Milan player most likely to have an impact on the game and he has notched an average of 14 points per game this season. Ricky Hickman has provided an average of 13.2 points game this season and Milan Macvan has offered up 12 points so far this campaign. The Italians have a strong offensive line up and with an average of 90.6 points per game this season, they are the second best team in this particular criteria. 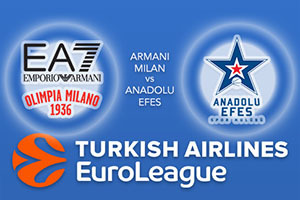 After three defeats in a row, things were looking gloomy for Anadolu but they have turned things around and Efes will be confident about heading into this game. They are picking up an average of 13 points a game from DeShaun Thomas while Derrick Brown is providing an average of 12.2 points per game. There is also a strong showing from Thomas Heurtel who is offering up an average of 9.6 points per game and an average of 6 assists. Efes are currently offering up an average of 86 points per game which is a lot more attractive than Milan’s average, which stands at 95 points per game. This could be a high scoring clash in Italy. The bookies think the hosts are favourite but if you believe in the importance of momentum, take Anadolu Efes Istanbul at +3.5 which is provided at odds of 1.90. For the Over/Under market, look to go OVER 169.5 which is provided at odds of 1.90. Bet Now!